Resources for operating ecosystem services markets, including tools, templates, policy forms, habitat quantification calculators, and trading protocols. The essential forms and policy addenda for credit trading program administration and project development. These resources complement the General Crediting Protocol (right) and the Verification Protocol (far right). Learn more about the Ecosystem Credit and Accounting System here. Water quality credits are quantified and verified units of environmental benefit to water quality that come from conservation and restoration actions on the ground. 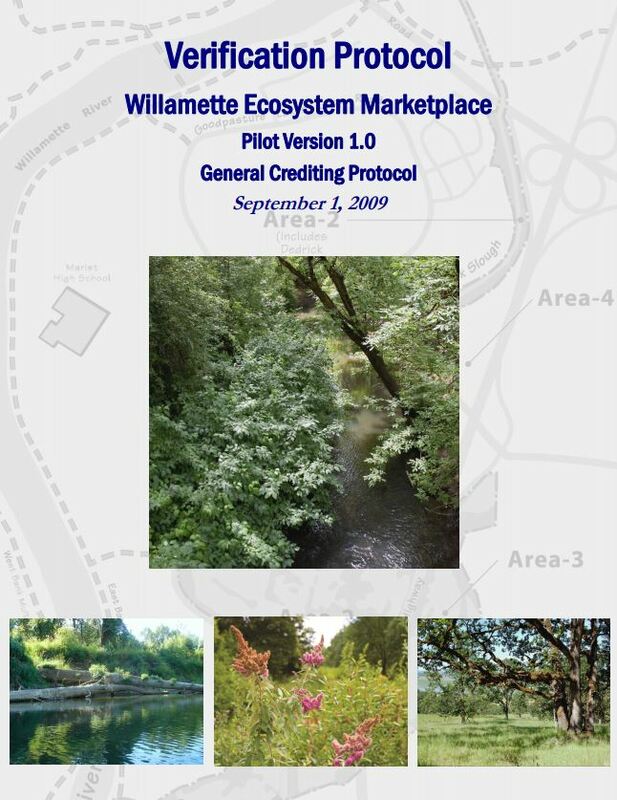 Willamette Partnership uses the Ecosystem Credit Accounting System to consistently track the ecological benefits of conservation investments for water quality. These conservation investments may be voluntary or driven by regulations. These credits have been used for water quality trading under regulatory requirements. Quantifying water quality credits can also provide increased accountability around incentive programs and other kinds of conservation investments. Nitrogen & phosphorus credits These nutrients act as fertilizer for algae and aquatic plants, provid­ing the foundation for aquatic food chains, but too much nitrogen or phosphorus can cause algal blooms, which reduces the amount of oxygen available to fish and other organisms. Nutrient credits provide a way to track reductions in runoff from conservation practices, both as an alternative to building expensive treatment technology and as a way of tracking progress toward watershed load reduction goals. Thermal credits Warm streams are a major limiting factor for salmon recovery—a problem with roots in lost watershed functions. Thermal credits provide a way for collective investment in restoring riparian shade, increasing instream flow, and other actions to prevent water from heating up rather than build expensive mechanical cooling infrastructure. The Nutrient Tracking Tool a web-based application that estimates the nutrient and sediment load leaving a farm field or pasture. It is intended for use by agricultural professionals or others familiar with farm procedures and conservation practices. NTT applies the field-scale runoff functions of the Agricultural Policy/Environmental eXtender Model (APEX), the same model used by the Natural Resource Conservation Service’s Conservation Effects Assessment Project (CEAP). It was developed by the Texas Institute for Applied Environmental Research at Tarleton State University with funding and technical support from the U.S. Department of Agriculture’s Office of Environmental Markets. The Nutrient Tracking Tool is approved by Oregon Department of Environmental Quality for use in water quality trading but has not yet been applied. Shade-a-lator is a component of the HeatSource model developed by Oregon Department of Environmental Quality. It calculates thermal load reductions (in kcal/day) from riparian shade restoration projects. Version 6.2 is best suited for field data collection; Version 8.0.5 and 8.0.8 (collectively, Version 8) are updated versions best suited for application via ArcGIS using the add-ons created by Oregon Department of Environmental Quality. The Water Temperature Transactions Tool provides a method of quantifying temperature reductions from flow restoration. It was designed by Watercourse Engineering with the National Fish and Wildlife Foundation, Farm Stream Solutions, The Freshwater Trust, and Willamette Partnership. The tool has not been applied to generate credits. However, it has been applied by The Freshwater Trust to better understand the benefits of instream flow restoration projects, such as the instream flow restoration agreement on Oregon’s Rock Creek. Habitat credits are quantified and verified units of environmental benefit that come from conservation and restoration actions in terrestrial and aquatic habitats. 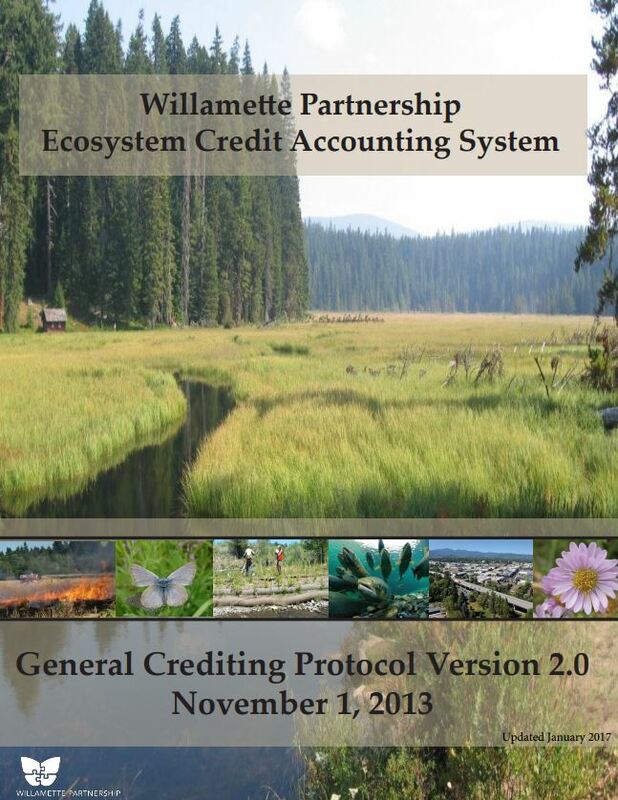 Willamette Partnership uses the Ecosystem Credit Accounting System to consistently track the ecological benefits of conservation investments for specific species or habitat types. These conservation investments may be voluntary or driven by regulations. Credits under Willamette Partnership’s habitat protocols have been used for mitigation under regulatory requirements, safe-harbor agreements, and consumer goods certification programs. Our General Crediting Protocol provides a pathway to generate credits for both terrestrial and aquatic habitat types. The Prairie Habitat Assess Methodology (PHAM) quantifies the function of prairie habitat by combining measures of habitat suitability, effects from surrounding activities, and other variables. It was developed by Willamette Partnership and ENVIRON to support mitigation and conservation of prairie ecosystems in Thurston County, Washington, and to create Thurston County’s multi-species prairie habitat conservation plan. The Upland Prairie Habitat Quality Calculator 2.0 quantifies the benefits and impacts to upland prairie habitat as well as to Fender’s Blue Butterfly, Kincaid’s Lupine, and associated rare plant habitat. The calculator incorporates ecological criteria from the U.S. Fish & Wildlife Service‘s 2010 Willamette Valley Recovery Plan for Fender’s Blue Butterfly and is being used to track recovery of Fender’s Blue Butterfly in the Willamette Valley. Upland Prairie credits are currently used on a voluntary basis but could be used to support compensatory mitigation with U.S. Fish & Wildlife Service approval. Willamette Partnership developed this calculator in partnership with the Institute for Applied Ecology. The Oak Habitat Metric assesses quality and function of habitat provided by oak woodlands and oak savannahs in the Willamette Valley. Credits generated using the Oak Habitat Metric are currently used on a voluntary basis. Aquatic ecosystem function credits are quantified and verified units of environmental benefit that come from conservation and restoration actions that improve the function of streams and wetlands. The tools provided below focus on the multiple benefits these ecosystems provide, rather than on the specific habitat needs of individual fish or wildlife species. The Ecosystem Credit Accounting System provides one potential model for tracking the ecological benefits of conservation investments. This kind of consistent accounting can help track and communicate the results of conservation investments, including both voluntary investments and those driven by regulations. Entities interested in creating or purchasing credits for regulatory purposes should contact the relevant regulatory agency early in the project planning process. The tools provided here can help quantify the outcomes of aquatic mitigation projects and programs, but they cannot substitute for consultations with agency staff. The Stream Function Assessment Method (SFAM) quantifies the benefits and impacts to the biological, hydrological, geomorphological, and chemical/thermal functions and values of streams in Oregon. Credits calculated by SFAM can be used to meet compensatory mitigation requirements under Section 404 of the Clean Water Act as well as under Oregon’s Removal-Fill Law. It was developed by U.S. EPA, Oregon Department of State Lands, and U.S. Army Corps with support from Willamette Partnership. These tools are also available at the Oregon Department of State Land’s Technical Resources: Waterways & Wetlands webpage. Floodplains are a nexus of critical ecosystem services, providing flood storage, improved water quality, fish and wildlife habitat, open space, and groundwater recharge. The Floodplain Habitat Metric Calculator quantifies the benefits of protecting or restoring existing floodplain habitat based on the assessment of a suite of physical properties associated with localized geological floodplains. The calculator is intended for application in western Oregon and Washington but may be adapted for use in other parts of the western U.S. The Oregon Rapid Wetland Assessment Protocol quantifies the benefits and impacts to the ecological functions and values provided by wetlands in Oregon. The credits can be used to meet compensatory mitigation requirements under Section 404 of the Clean Water Act as well as Oregon’s Removal-Fill Law. The protocol was developed and is maintained by Oregon Department of State Lands.